The trouble with Valentine’s Day is that there just aren’t enough romance novels that make it a central part of the story. I mean, we get a deluge of books for Christmas, quite a few that celebrate summer. But Valentine’s Day is the day of love. Of passion. Why not more Valentine’s Books? 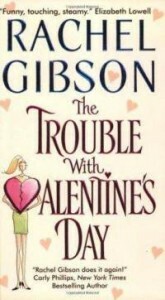 I’ve been reading romance for years and the only one I can think of is the fantastically named The Trouble With Valentine’s Day by the even more fantastic Rachel Gibson. I’ve read all but two of Rachel Gibson’s novels – and I’m saving those to perk me up during a really bad week. I absolutely love her books, and Valentine’s Day is no different (even though the hero has the same name as my brother, a massive turn-off meaning that in my head I think of him as Raj. I know it’s a stretch.). When everything about her life in Las Vegas just seems to be going wrong, Kate Hamilton leaves her job as a PI and points her car toward Gospel, Idaho. Gospel is the kind of town where a girl can take it easy and just be herself, or so she hopes. But when she gets there, people get the impression that she’s a bit of a ball–buster. And she is, at first. Whatever your romance needs today, there are some great reader-generated recommendations at All About Romance, which has just released its 2011 readers’ poll results. Some fantastic reads there! Do you have any Valentine’s Day novels to recommend? Why aren’t there more out there? Have you read The Trouble With Valentine’s Day? What did you think? Do you have romantic Valentine’s plans – whether a date with a loved one or with a good book? I’ve just read two story with St Valentine in it ^^ both in the book Deadly Valentine: Her Un-Valentine by Justine Davis and The February 14th Secret by cindy Dees. I do know of a couple of PNR V’day books: Bitten by Cupid (anthology) and Be Still My Vampire Heart by Kerrelyn Sparks. Good Stories. I’m ashamed to admit it, June, but I’ve never read a PNR. *ducks* But I can totally see how Valentine’s day would lend itself to paranormal romance. Hope you found a great book to curl up with! I have read Gibson’s book and remember enjoying it. I am especially excited that she finally has a new release this year! Me too, Suz! I can’t wait to read it. I read “The Troubles With Valentine’s Day” few weeks ago & I liked it very much. Unfortunately I wasn’t able to find other VD books. No special plans for today. I just received pink tulips from my boyfriend & we’ll cook dinner together later. I can’t think of any books – isn’t that horrible – although I see some here now. I’ve been married a long time so some years are better than others – this is a good one lol. We went to a dinner/dance at our American Legion (and won some naught door prizes lol) and my husband got me and our two daughters candy and lotter tickets (one daughter won $20) and tonight I am taking him out to dinner. Yes, a very good year. Hope you enjoyed your dinner out! I have read Rachel’s books. I would recommend an Jinxed!, a Blaze anthology. I’ll have to look for that one, Jane. Thanks for the rec! I haven’t read that one yet. There don’t seem to be too many of them about Valentine’s Day, don’t know why. I just downloaded a free one from Amazon called A Valentine from Harlequin: Six Degrees of Romance. It’s got some great authors so hopefully it will be a good one. What if you gave six authors the same opening paragraph and let their imagination fly? That’s what we’ve done in A Valentine from Harlequin: Six Degrees of Romance! I’d love to know what you think of it when you finish it. Haven’t read any Valentine books this year. Also don’t have any big plans for the day hubby has to work.